Designed specifically for surfaces that require a deeper seal. RoofSeal PLUS features a UV stable backing that is available in white and black. It features EternaBond®’s advanced MicroSealant™ Technology. Therefore, with the exception of cleaning the repair surface, RoofSeal PLUS is literally a one-step permanent repair system. RoofSeal PLUS creates a water proof, moisture and air tight barrier. 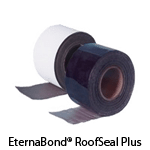 RoofSeal PLUS remains flexible to temperatures as low as -70°F.